This is a very colourful and jolly brooch from the French Designer Lea Stein. 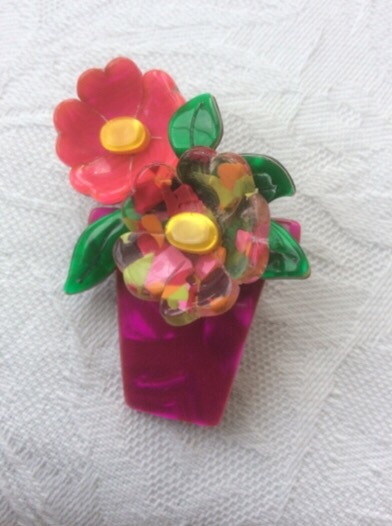 The brooch is made from acrylic plastic with cellulose acetate or Rhodoid and is very light and easy to wear. It features two flower blooms in a deep pink pot with green leaves. The pink bloom has a yellow centre so does the other flower which is an acrylic with chips of multi coloured plastics embedded in it. One of the daisy flowers has a marble type finish, achieved by layering the cellulose acetate which gives depth to the design. 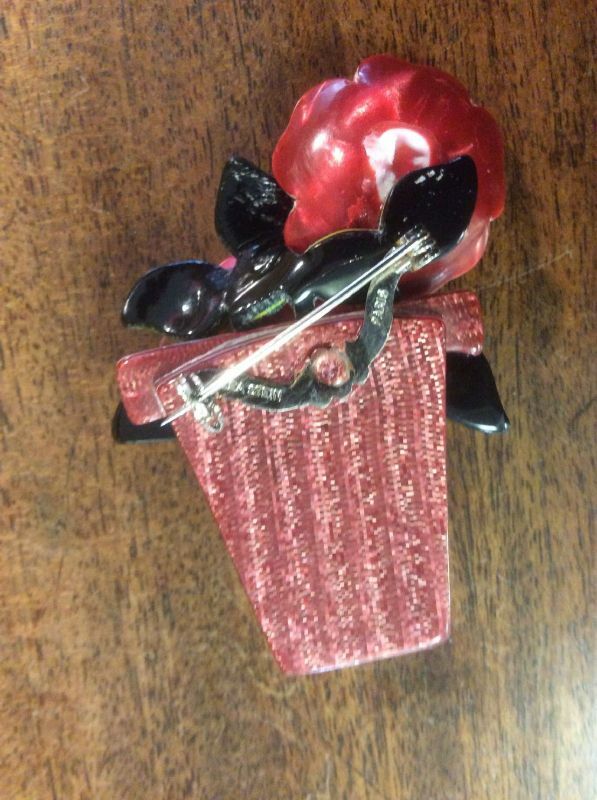 The brooch has a 3-D effect when worn. 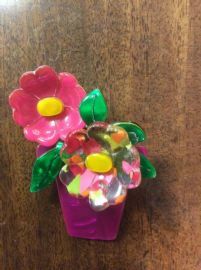 This flower pot brooch measures approximately 5.5 by 4.5 cms at its widest parts and has the traditional Lea Stein pin back with a roll-over type fastener. The piece is signed - 'Lea Stein, Paris'. This is a contemporary design from Lea Stein. 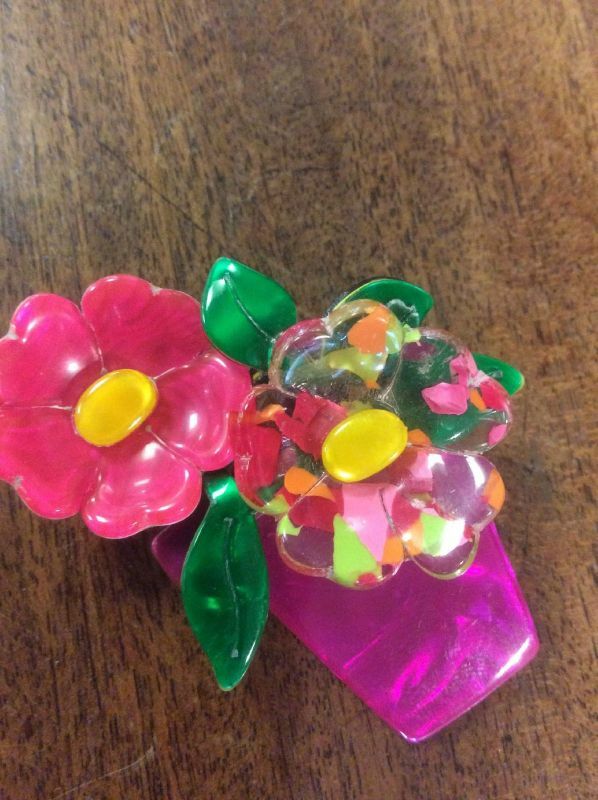 Please note it has a low price because there is a white indented mark to the reverse of the pink flower. The normal price for this style of pin is £68. The mark doesn't detract from the wearability or beauty of the brooch in anyway, just means it is a bargain! LEA STEIN was born in Paris in 1931 and worked as a dress designer. 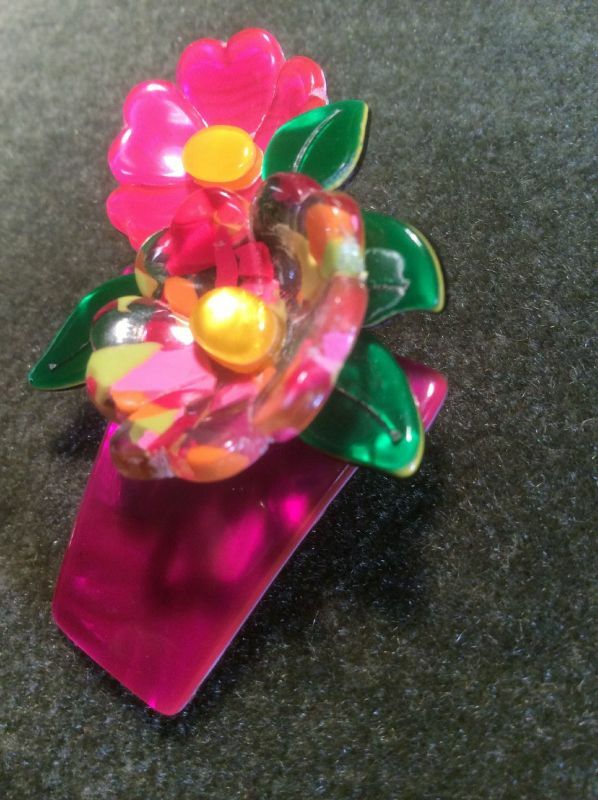 She began making her now famous Jewellery when her husband, Fernand Steinberger, ( a Plastics Chemist ) discovered a process of laminating cellulose acetate to create a unique range of colours & patterns. Buttons for her frocks were their first products; followed by brooches, bangles and earrings. The factory was forced to close in the 1980’s but has since re-opened much to the relief of costume jewellery collectors and Lea Stein fans. Lea Stein loves to produce designs based on animals and flowers. Now she is quite an elderly lady but still introduces a couple of new designs each year. Each brooch has the trademark ‘V’ shaped pin on the back and is signed: ‘LEA STEIN PARIS’. The manufacturing process used means that no two pieces are exactly alike. The fabulous designs, the ease of wearing and their quirky appeal are just some of the reasons why they are so collected around the world today.